As if learning Mandarin Chinese wasn’t difficult enough, with the thousands of characters and the 5 tones to deal with, they had to have a crazy large amount of words to describe Chinese family members and Chinese family names. Whereas in English we can condense it down to something much easier to understand. Which is just basically describing someone’s position in the family. For example: Mum’s sibling’s son (if older than you) –表哥 (Biǎo gē). And yup, there’s another word for mum’s sibling’s son if younger than you. Coming to China, you may have noticed the importance of addressing people and learning about etiquette and traditions. Depending on your age, whether you’re male or female, and in what capacity you’re meeting somebody, you will be addressed as something else. Upon first coming to China, I was horrified with the number of people calling me ‘美女（Měinǚ)’ which literally translates to ‘beautiful woman’. I’m pretty confident with my looks… But to be called this several times a day… In England, it would be pretty creepy. But, I soon learned that it is just a polite form of address. 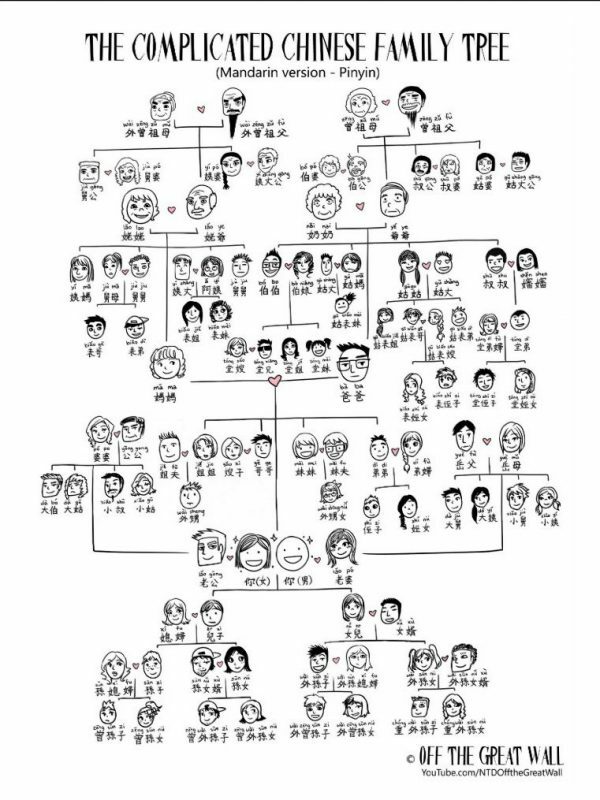 Interestingly enough, you will also hear Chinese people referring to their “brothers 哥哥 gēge” and “sisters 姐姐 jiějiě” meaning that they are just close friends, but not actually family members. So it is always confusing when someone introduces a group of guys as their “brothers” and you wonder just how many kids are in their family…! This is also said for “Uncle 叔叔shūshu” and “aunt 阿姨 āyí”. Using the correct terminology is very important in Chinese culture, and this doesn’t stop with family members either! 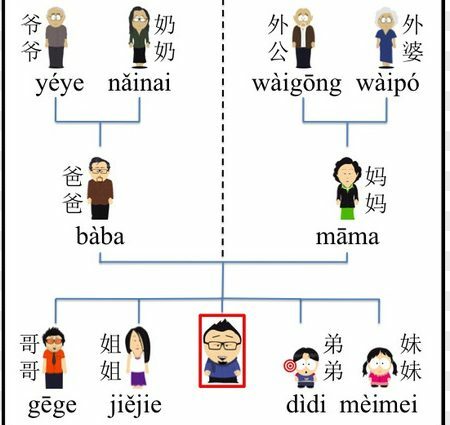 What makes it more complicated, however, is that in different Mandarin Chinese dialects – things change around, and different areas in China have different preferences of how to refer to their family members. Does your head hurt yet? Whilst you shouldn’t worry too much about memorising all of these, it’s something fun to learn and will definitely impress your Chinese (and foreign) mates. Plus, it will certainly make a good impression if you’re meeting a Chinese family over Chinese New Year! That was A.W.E.S.O.M.E !!! And I don't even think I can name that many people in my own family, whether in French or English!!! 哈哈哈！ Thank you! So good isn't it but my word what a headache! Suppose we best get memorising them as fast as possible!